Within the brief span of “Romance Novels for Dummies” playwright Boo Killebrew uses her facility for dialogue to help the audience consider both serious and comedic life issues: how to survive loss, how to parent alone, how to heal and maintain a sibling’s love, and how to be oneself. And one more thing that requires survival skills – a surprise visit from the in-laws. In this premiere at Williamstown Theatre Festival, the actors deliver all these themes with a quick pace – there is no time to get mired down in one before the next one comes along. 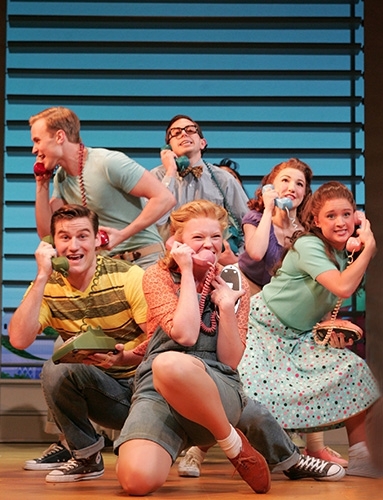 It all works splendidly with this well-tuned ensemble and well-crafted play. High kudos to the principals, Mary Wiseman and Ashley Austin Morris, who both shine as the sisters, Liz and Bernie. Struggling to make life work after tragedy and to overcome an old rift is only part of their challenge in contemporary New York, where Bernie’s comfortable free-spiritedness and Liz’s old school innocence collide. They are equally determined to love and to make a life for Liz’s daughter but the path to that goal is full of glitches. Ms. Wiseman’s “melt-down” brought tears. Justin Long rises to the challenge of playing three of Liz’s blind dates, most comically as the “personal trainer” and most caringly as Myron. As the in-laws, Andrew Weems and Connie Ray both bring a perfect balance of interference and loving in their all-too-brief appearances. 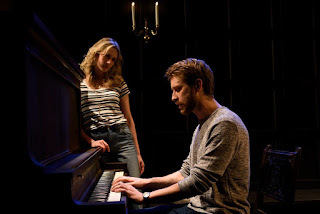 This premiere presentation fulfills the expectation of excellence that audiences hold for Williamstown Theatre Festival. The stage and set are used well, but lighting deserves special mention. A wall of bookcases in front of a larger “brick” wall of neighboring apartment windows sets both the urban and domestic scenes and provides intriguing variations in lighting effects. Boo Killebrew achieves the ultimate: the audience is left wanting to know the rest of the story, to follow these characters through the next stages of their lives and especially to hear more from this new playwright. 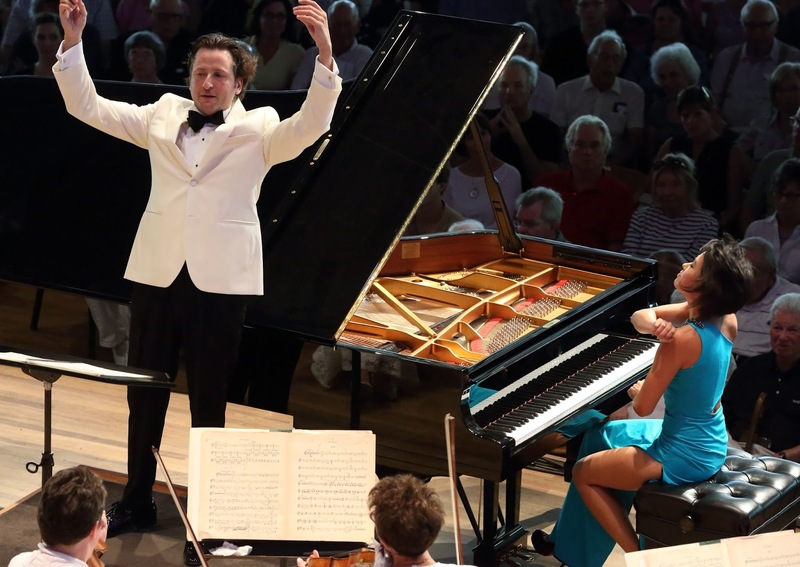 Summer in New England offers a bounty of artistic endeavors: outdoor concerts, festivals of all kinds, and of course, top-notch theater. “Midsummer” (a play with songs), written by Brit David Greig and Scotsman Gordon McIntyre is no exception. As its title suggests, this delightfully funny and romantic play offers us a pair of mismatched lovers and a magical evening that transforms their lives, just as it did in Shakepeare’s Midsummer Night’s Dream. In an Edinborough wine bar Bob (M. Scott McClean), a petty criminal, who reads Dostoyovsky’s “Notes from Underground” (as he says “to cheer himself up”), meets Helena (Rebecca Hart), a successful but lonely divorce lawyer. We learn about their budding relationship through a series of hilarious and poignant vignettes. Both Bob and Helena take turns at narrating events. As Helena puts it: “Bob expresses the feelings in the story while I tell the truth.” Director Tracy Brigden shows these contrasting viewpoints through a series of rewinds and replays of key events in a manner reminiscent of “Groundhogs’ Day.” Their, at times, tumultuous relationship ends at a point of satisfaction for both characters and audience members alike. The impressive, yet gargantuan set is such an oversized pile of old furniture, bicycles, and junk that it detracts from the intimacy of the show’s central relationship. Designer Narelle Sissons not only designed this, but also the simple, contemporary costumes consisting of leather and denim jackets that perfectly reflect the lifestyle of these thirty-somethings. 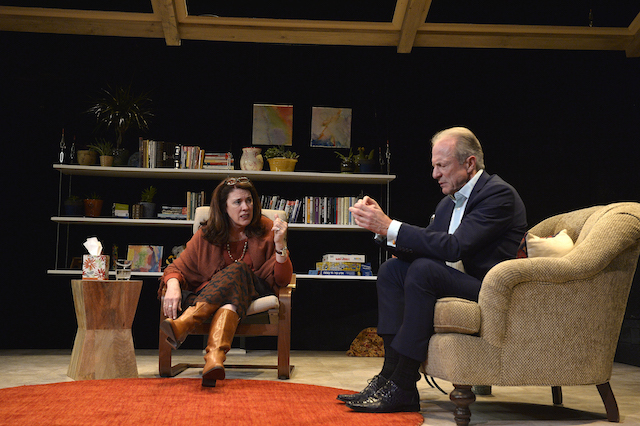 Theatre goers will be impressed by the masterful acting, stunning production values and uplifting message in Chester Theatre’s production OH GOD by Anot Gov. Beautifully performed by Maureen Keiller and Will Lyman, OH GOD is a play about transforming despair into hope, and the healing powers of love and compassion. There is plenty of wry humor and comedy to be experienced in this play as well, thanks to the skill of the two actors, and a very clever script. The plot involves a deity in the throes of depression, who arrives at a therapist’s door one day. It appears that God is traumatized by humanity’s inhumanity, and his own part in the history of the wicked world he helped to create. Their conversation is filled with burning questions about the purpose of life and the survival of mankind, interspersed with humorous, touching and sometimes tragic anecdotes. Keillor and Lyman both possess superb timing, and are able to blend very profound sentiments and ideas with human candor and frailty. They bring a lightness to what would otherwise be a rather dark story, and hold their audience spellbound, not knowing whether laughter or tears will come next. The subtle touches added by director Guy Ben-Aharon also help remind the audience of the beauty and delicacy alive in this naughty world, such as God’s carefully wiping his feet before he enters the therapist’s office, and the lovely birdsong that plays softly during several of the scenes. As is always the case at Chester Theatre, the technical aspects of this play are stunning. Cristina Todesco’s set design, with an overhead flying batten, lush hanging plants and a bookcase attached to nothing give one the impression of being suspended between worlds, and the gold and amber colors in the lighting created by Lara Dubin suggest the burning heat of a summer day. Special mention must be made, too, of the lovely costumes by Charles Schoonmaker, which also add so much to the production. Keiller looks quite the goddess herself, swathed in scarves and a flowing skirt, and God is dressed in charismatic and comfortable blues. The costumes tell as much about the characters as the actors themselves. With its compassionate theme, and all the artistry of its performers and creators, OH GOD is an inspiring production, well worth the journey into the hills of Chester. What happens when a staunch Democrat, a loyal Republican, and Miss Georgia occupy the same room? Now, let’s go backward approximately 200 years. What happens when James Monroe, Thomas Jefferson, and a prim and proper southern gent (sorry, couldn’t catch the name) meet in yet another room? 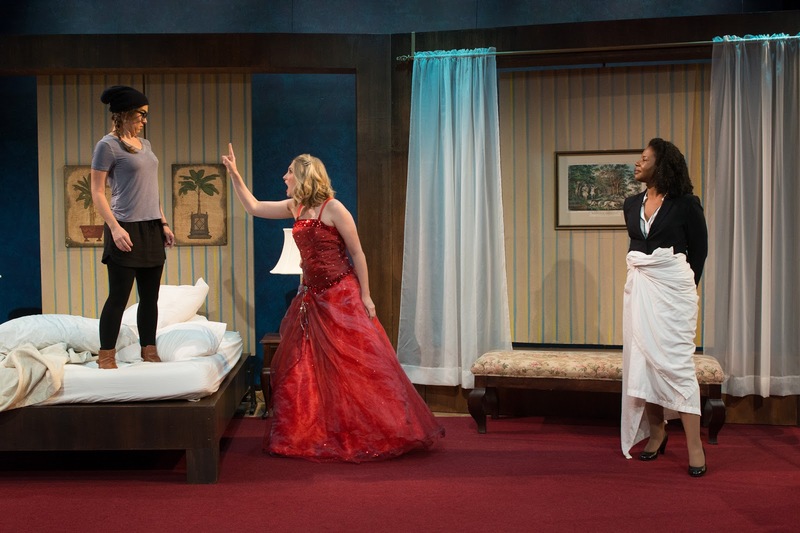 In the case of Lauren Gunderson’s “The Taming,” both scenarios mix and confuse politics with intent, along with lot of laughs. The play’s title, supposedly related to Shakespeare’s “The Taming of the Shrew” is a misnomer. The script is by no means Elizabethan or shrewish. Aside from the heading, Shakespeare & Co. presents an edgy piece of present-day and Revolutionary-era intellectually sound political bantering. It helps audience members appreciate the dialogue if they are attuned to this year’s presidential election. Most of us are. Yet, in spite of having learned decades ago from textbooks about the successes, points of view, and compromises of our Founding Fathers, it is safe to say that many playgoers have forgotten a lot of the history. No matter. The trio of actresses brush up our memory. Maddie Jo Landers, Tangela Large, and Lucy Lavely, all newcomers to this venue, bounce jargon and humor on the subjects of justice and responsibility at a non-stop pace directed by Nicole Ricciardi. Large expresses her two roles (Senate aide and James Monroe) distinctly. Lavely, as a liberal blogger and slave-owning Southerner, makes the most of her parts although a suggestion would be to tone down the verbal volume. Landers shines, particularly as the Miss America wannabe. Her Southern belle accent, charm, and cunning accentuate her job of intermediary between Blue State girl and Red State girl. Each nuance and hand gesture give Miss Georgia the upper hand (pun intended) in the comings and goings. By no means is “The Taming” a straight forward comedy. Countless undertones and overt insults about the 200-year gap between then and now, between resolve and reality, are at the crux of the plot. Think “Electoral College” – perhaps a smart idea in 1789. But now? The debate at the beginning of the play as to whether a photojournalist is just an objective chronicler of what happens, or should become involved in the actions that they capture on film -- especially those of raw human suffering – sets the stage for what follows. For Sarah and James, photographer and writer, respectively, it is the conflict of whether they return to the next battle front and risk more pain and suffering for one more story, or withdraw to a more conventional life in suburbia and marry. For Richard and Mandy, it is whether their sudden spring/fall romance is genuine and lasting, or just another convenient fling for both. Interspersed with these moments which stop the characters in their personal or professional tracks, are other moments of decision, as personalities clash. The battle-stressed and scarred Sarah is pitted against the perky insights of the youthful and seemingly untested Mandy. Richard and James clash over Richard’s stalled writing career, and the weight of personal loyalty vs cold business decisions, and those who must make them. Add to the mix the discovery of infidelity, betrayal, and more than a few personal demons, which confound these four people and make their ability to move on with their lives truly wrenching experiences, but ones which will not go away and must be dealt with, for life to go on with any meaning or validity. Director Nichole Ricciardi puts her cast – Kim Stauffer, Nathan Kaufman, Sam Rush, and Alana Young – through their paces and delivers a show which poses provocative questions, and some interesting, if not expected, answers. Located in Stockbridge and Pittsfield, BTG is the home of four theatre venues. This interview with Artistic Director/CEO Kate Maguire focuses on the 10th anniversary of the re-opening of the renovated Colonial Theatre. Built in 1903, the $21million restoration has recreated this exquisite building with its pristine acoustics, classic gilded age architecture and state of the art technical systems to host theatre, family entertainment, comedy, and live music year round. Spotlight: Who were performers/plays presented in Colonial’s heyday? Kate: In the early Colonial days, the company presented shows as often as possible. Early shows included Ibsen’s controversial play Ghosts, a cast of 300 in Fifi in the Toy Shop, and Irving Berlin’s premiere of Watch Your Step. The Colonial was a stop in Sarah Bernhardt’s farewell tour. Dancers Martha Graham, Ted Shawn, and the Denishawn Dance Company have also graced The Colonial stage. Spotlight: What was the impetus to combining Colonial with BTF? After 2008, and the economic downturn, I became much more active in looking for partnerships and collaborations. I happened to walk into The Colonial and met with two wonderful trustees. At that point, their board was looking for a new executive director. We began a conversation about what it might look like for the organizations to truly be partners. After conversations with BTF’s board, the community and civic leaders, we determined that this would be the way to bring two historical theatre organizations together, and create art for a theatre community year-round. Spotlight: To what degree was Berkshire Theatre Festival (BTF) involved in renovation of the Colonial? Kate: Berkshire Theatre Festival supported the renovation. I was on the original Board of Trustees for The Colonial. We were in the very early stages of thinking about what that theatre would mean to a community. Spotlight: What is the mission of Colonial? The same as BTF? 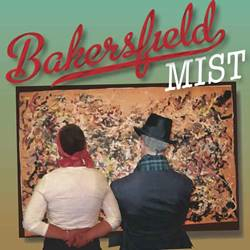 Kate: The mission of the Colonial has always been very similar to the Berkshire Theatre Festival; our goal is to present great work, and to make sure that while we’re presenting that work on our stages, we are being mindful of what it means for a not-for-profit to support the creative vitality of a community. The heart of our mission is to educate, enrich, and entertain through the art of theatre. Spotlight: How are the various venues a good match? Kate: Each theatre is unique. The Fitzpatrick Main Stage (approximately 300 seats), in a historic building, that oozes the feeling of summer theatre. The Unicorn (just over 120 seats), which was more recently built, is an intimate space. The Garage, inside of the Colonial, is a black box; we can move that area around. The Colonial Theatre itself is over 700 seats, and a beautifully restored theatre—an architectural jewel. Spotlight: How do you choose which performances will be mounted at Colonial or the Stockbridge theatres? Kate: The Fitzpatrick Main Stage has always been home for the classics, new plays and plays with large themes. The Unicorn Theatre, is a space for a young generation of theatre makers, as well as more experimental work. The Colonial was built by a community, so people would have a creative home to go to year-round. There are no barriers at the Colonial—I hope there are no barriers to any of our theatres. 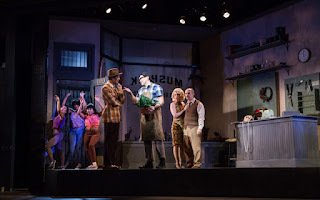 It’s no less intense in terms of the quality of the work, but more familiar to audiences; Little Shop of Horrors, and musicians and comedians that perform all year-long. Spotlight: What are you most proud of that has occurred at the Colonial? Kate: I would say that we are most proud of the development of our Annual Community Theatre Production. Every member of the community is truly making the Colonial stage their own; embracing it, and entertaining. What happens in that room is one giant hug. Young people walk into that theatre as if it’s their own. This year, our Annual Community Theatre Production is the Beauty and the Beast, where 120 talented young performers will take the stage. Spotlight: What are future plans? Kate: Future plans for the Colonial always involve making sure that we keep the building in the best shape, and that requires constant fundraising. [Important is] maintaining the structure so that it continues to be as glorious as it looks right now, and is sturdy for the future generations. We will continue to expand our education programs. We serve 13,000 school children with a variety of program. We are instituting pre-K programming as well. Our programs are based on language, and helping people to communicate more powerfully. The essence of great theatre is to try to understand each other in stronger ways, and to be able to better listen. While there’s a goal to always entertain and put on great plays, we take our not-for-profit role very seriously. We know how much effort was put in to all of our theatres, and that as leaders in the community, we have a responsibility to educate. Spotlight: Any anecdotes about the Colonial that you’d like to share? Kate: The work that we’re doing with youth is transformational. We have young people that we have been working with for a dozen years—they have become the teachers for the new students. Being quite familiar with “Little Shop of Horrors,” anticipation of enjoying this relatively ridiculous, sci-fi, 1950’s rock & ballads, musical comedy was not difficult. There were, however, some significant differences from the norm in the Colonial’s production. Director Ethan Heard takes casting and costuming far, far away to another dimension. A Ronettes-type girl trio (all super singers) serve as the chorus (literally and figuratively) moving one scene to the other smoothly. Poor nerd and our hero Seymour becomes the talk of the town and savior of Mushkin’s Flower Shop with his strange new plant. Not spoiling too much, it is soon realized that Audrey II (the plant) is a hungry creature dependent on human flesh for dinner. Stars of the show are Taurean Everette and Bryonha Parham (the plant). The female voice and body unlike any Audrey II that I’ve seen, create some pretty scary vegetation. Yet, Parham’s style is often too shrill even for an outer space being. Lindsay Nicole Chambers, whose soprano voice is smooth and lovely, brings with her shop girl/wannabe Seymour love interest a naïve humor. “Shop” is not all fun and games, however, exemplified by the life of this particular character. 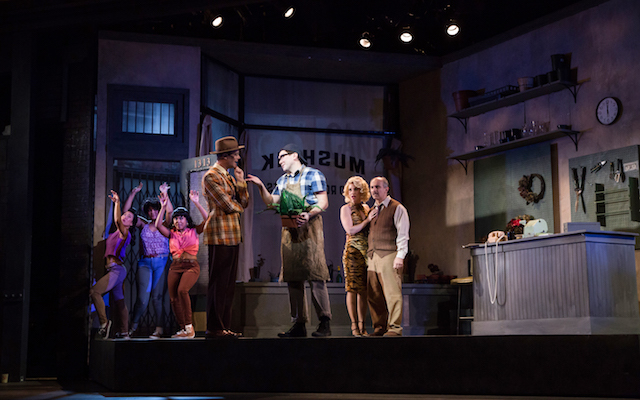 Stanley Bahorek (Seymour) and Stephen DeRosa (shop owner Mushkin) are skilled in their roles, and neither is required to sing any music of significance. James Ludwig (Dentist) purposely steals scenes from everyone. His sadomasochistic dentist is gruesome with his rusty dental tools, machismo in his black leather jacket, and delectable for Audrey II’s “Suppertime.” Ludwig makes much fun of his own characters. As noted, it is the director’s choice for this musical to stand alone among others with the same name. Over the years, there have been different endings to “Shop,” however, the transition from delightfully weird throughout most of the show to strangely silly only at the very end, wasn’t necessary. Reid Thompson’s set design – primarily inside and outside of the flower shop – works well. Parker Esse’s choreography is enjoyable in the “Ronette” scenes and the especially the play’s opening “Skid Row” ensemble piece. Goodspeed has succeeded. Under the dynamic direction of Jenn Thompson, enlivened by Patricia Wilcox’s crisp choreography and David Krane’s dance arrangements, this ageless musical has taken on new vitality and exuberance, appealing to theater-goers of all ages. “Bye, Bye Birdie” echoes the real-life story of Elvis Presley, who was drafted into the army in 1957, provoking a media circus that included his giving a member of the Women’s Army Corps “one last kiss.” Conrad Birdie (Rhett Guter), the rock-and-roll legend of the title, is likewise drafted, and his agent and songwriter, Albert Peterson (George Merrick), in tandem with his secretary and sweetheart, Rose “Rosie” Alvarez (Janet Dacal), come up with a publicity stunt—Birdie singing “One Last Kiss” and giving one lucky girl in a small town in Ohio a real “last kiss” on the “Ed Sullivan Show” before going into the Army. Throw in a few subplots—Alvarez giving Peterson a final ultimatum (give up the music business or else); Mae (Kristine Zbornik), Peterson’s overbearing mother, constantly meddling; 15-year-old Kim MacAfee (Tristen Buettel) being chosen to receive “the kiss” despite protests from Hugo Peabody (Alex Walton), her new “steady;” and the disruption Birdie’s arrival causes in small town Sweet Apple, especially in the MacAfee household. Casting is spot-on. Guter renders Conrad Birdie’s two-sided character exceptionally well. On cue, he is the hip-thrusting, gyrating teen heartthrob, who makes even the mayor’s wife (Marci Reid) swoon and faint. Behind the scenes, he is the MacAfees’ selfish and rude house guest. Guter’s performance of “Honestly Sincere” sends screaming, frenzied teens into the aisles to the audience’s delight. 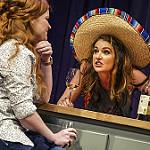 Merrick is charming and playful as he tries to convince first Alvarez, then a downcast teenager, to “Put on a Happy Face.” Dacal wows the audience with “Spanish Rose,” a delightful declaration of her determination to kick up her heels Spanish-style to spite Peterson’s racist mother. Thanks to Daniel Brodie, nostalgia pervades as black and white TV screens project Ed Sullivan and other throwbacks to the ‘50s and ‘60s. Staging and costumes are period-perfect, the cast is filled with great voices and fantastic dancers, and the entire show is simply delightful. What’s not to love? 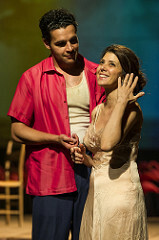 Director Tripp Cullman has taken a fresh approach to Tennessee Williams’ most upbeat play, “The Rose Tattoo.” In the Williamstown Theatre Festival’s first production of the season, Marisa Tomei embodies the lusty Serafina who struggles with her daughter, her dead husband’s checkered past, and her own carnal desire in this multi-layered production. Tomei is funny, sympathetic, and physically perfect as a Sicilian immigrant in a geographically-vague community of immigrants in an ambiguous Gulf-community. She delivers her lines with exquisite comic timing and physical punctuation that extends through her fingertips. She is well-matched by a cast of top-notch actors and newcomers, including energetic small children and even a goat. Lindsay Mendez has a rich bold voice, and sings folk tunes that help shape the mood of the scenes, and Christopher Abbott as the Italian truck driver who is “the grandson of the village idiot” and the man who ignites Serafina’s passion, are standouts in the play. Constance Shulman and Barbara Rosenblat (both familiar to audiences from “Orange is the New Black”) have smaller roles, but bring great characters and depth to the storytelling. The scenery, lighting, sound, costumes, and the projection of rolling waves are blended beautifully, and at times, actors enter on a ramp from the back of the audience in this large theatre. In addition, some scenes are played on the ramp, giving extra dimension to the production and adding a level of intimacy to the thoughts and desires of the characters. The production is distinguished by the physicality of the cast and the sense of space. Like much of Williams’ work, the play invites us to identify with every character, tradition, and desire, and this production celebrates the life that like the Gulf waters, continually wash over us with both human fragility and strength. This is a beautiful production that brings insights to the work, and celebrates life, love, and heartache. It’s a tribute to an American master, and to the way theatre illuminates the human condition. Lovers of both fine theatre and classic literature have an introspective, romantic experience awaiting them in Chester Theatre’s first offering of the season -- “My Jane” by Daniel Elihu Kramer. The play is a creative interweaving of the story of “Jane Eyre,” and the reminiscences of four contemporary people sharing their first encounters with Charlotte Bronte’s masterpiece. The play meanders back and forth in time, with the four modern folks enacting many of the characters in the classic novel themselves. The play brings to light the power of story, and how our encounters with truly great literature can draw us in and affect us forever. Much honor must be given to the versatility of all the actors, playing multiple roles as the story unfolds. Camila Cano-Flavia and Alex Hanna perform the roles of Jane and Mr. Rochester with quiet intensity, and Laura Ramadei as the narrator tells their tale as only a true bard can do: giving just enough so the audience creates the scenes as much in their imaginations, as the performers do onstage. A remarkable performance is given by Claire Siebers, portraying numerous characters who appears very quickly on and off throughout the play. The mannerisms and physicality of each character as she brings them to life, often instantly, are a joy to behold. Director Knud Adams keeps the elements of past and present, multiple settings, and many characters in balance for this production successfully. The transitions are seamless and flowing, allowing the audience to wander freely through the reflections of several modern individuals, as well as the romantic imagination and characters of Charlotte Bronte, throughout the play. Kudos must be given for superb set and lighting design by Oona Curley, for support in all the storytelling. The classic library-paneling backdrop affords itself beautifully to both new and old scenes. The lighting changes also help make transitions from “now-to-then” believable, and far more than memorable.